Justin is a hero among students. 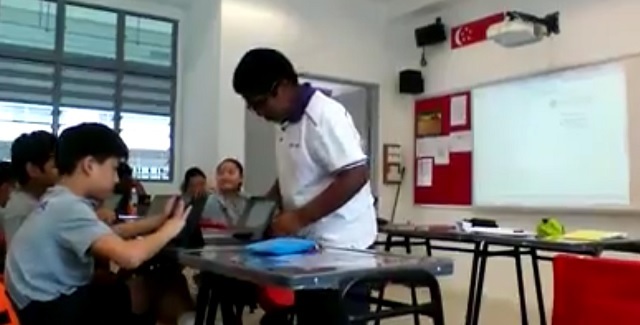 A video – secretly shot with a handphone or even a tablet that the students were using in class – showing him demanding an apology from a male teacher in class made sure of that. But most adult viewers of the video think Justin should be caned or sent to a school or class for children with learning disability. The teacher had yelled at Justin to go back to his seat. He was moving about other students’ desks. The teacher should not have shouted, most social media respondents say. But by acceding – in front of the whole class – to Justin’s demand that he say “Sorry I shouted, Justin”, the teacher showed he had no class management skill. The teacher should have exercised his authority over the boy calmly but firmly. This is easier said than done, especially with normal technical students, whom teachers generally dread having to teach. But the boy must also understand that there is no room for rudeness and be sent for work service, like picking up litter during recess time. And perhaps given the task of writing an essay about an episode in his home life, when he was last punished by his parents. “The lesson for all — teacher, boy and classmates — is to show that disrespect does not have good consequences,” said one senior teacher. Apparently, Justin has since been counselled and has apologised, as has the student who uploaded the video on Youtube (which has since taken down). Justin’s parents? There’s been no word from them, but judging by the boy’s behaviour on the video, they’re unlikely to be surprised.